Today I would like to explain why a bridal trial for your wedding day hair and makeup is SO important. Check out these before and after pictures for proof! As you can see in the side-by-side comparison photos, her makeup looks very similar. This is the idea when it comes to a bridal makeup trial. 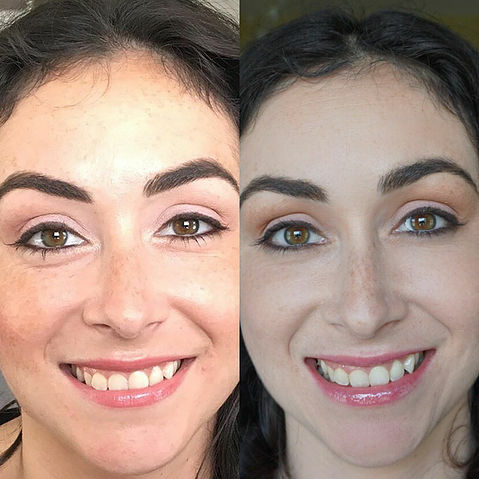 We intensified her eyeshadow just a little bit on her wedding day, as well as slightly changed the lip color. These are simple changes that can easily be done on the wedding day to ensure you love your makeup 110%. Having bridal trial for both your hair and makeup is extremely important to make sure we nail your ideal bridal look prior to the wedding day to reduce stress for both parties. If you makeup artist or hair stylist ask if you are interested in booking a trial, the answer should always be YES!